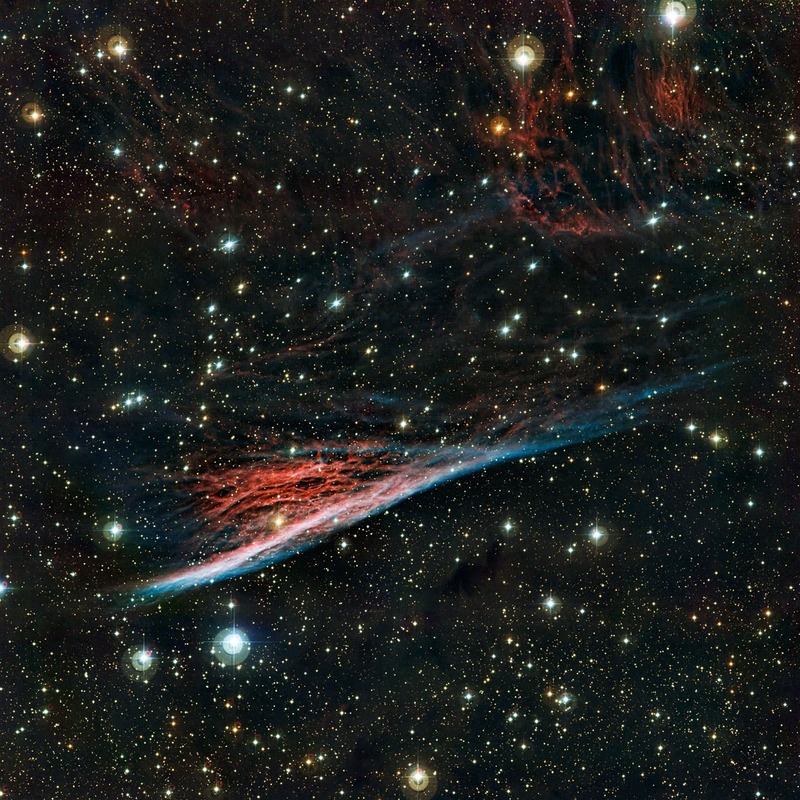 The Pencil Nebula is pictured in a new image from ESO's La Silla Observatory in Chile. This peculiar cloud of glowing gas is part of a huge ring of wreckage left over after a supernova explosion that took place about 11 000 years ago. This detailed view was produced by the Wide Field Imager on the MPG/ESO 2.2-metre telescope. 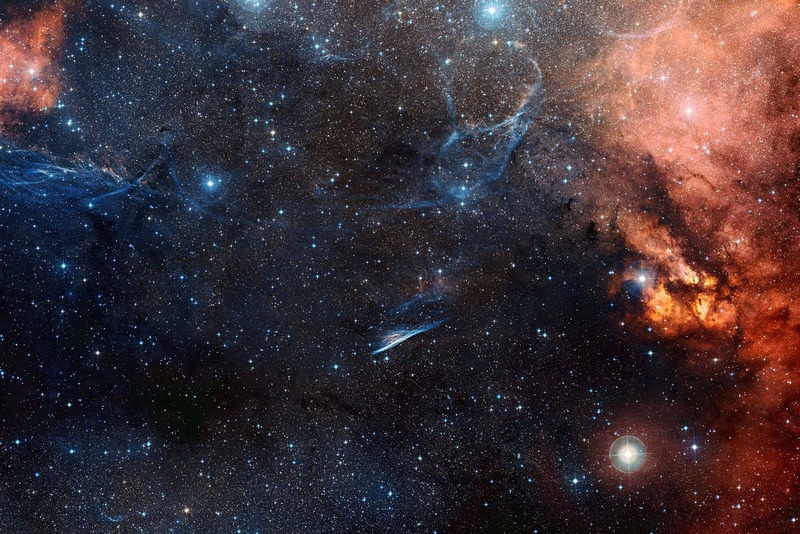 This image of the region of sky around the Pencil Nebula shows a spectacular celestial landscape featuring the blue filaments of the Vela supernova remnant, the red glow of clouds of hydrogen and countless stars. It is a color composite made from exposures from the Digitized Sky Survey. This new image from the Wide Field Imager on the MPG/ESO 2.2-metre telescope at ESO's La Silla Observatory in Chile shows the Pencil Nebula against a rich starry background. This oddly shaped cloud, which is also known as NGC 2736, is a small part of a supernova remnant in the southern constellation of Vela (The Sails). These glowing filaments were created by the violent death of a star that took place about 11 000 years ago. The brightest part resembles a pencil; hence the name, but the whole structure looks rather more like a traditional witch's broom. A large bubble-shaped region of glowing gas in the constellation of Vela (The Sails –image below) is the home of the Vela supernova remnant, gas clouds that were ejected from a dying star in a huge explosion about 11 000 years ago. This new image shows large, wispy filamentary structures, smaller bright knots of gas and patches of diffuse gas. The nebula's luminous appearance comes from dense gas regions that have been struck by the supernova shock wave. As the shock wave travels through space, it rams into the interstellar material. At first, the gas was heated to millions of degrees, but it then subsequently cooled down and is still giving off the faint glow that was captured in the new image. By looking at the different colors of the nebula, astronomers have been able to map the temperature of the gas. Some regions are still so hot that the emission is dominated by ionised oxygen atoms, which glow blue in the picture. Other cooler regions are seen glowing red, due to emission from hydrogen. Image Credit: ESO/Digitized Sky Survey 2 Acknowledgment: Davide De Martin.